New Website, Bluebonnets are coming! After several months in the works, I’ve finally got new website up and running. With thanks to Jack Brauer at http://www.widerangegalleries.com, my Images from Texas site is live! I just returned from two trips – one to San Antonio where I had an opportunity to photograph the riverwalk and Alamo. After that, I trekked out west and spent some time among the bluebonnets at Big Bend National Park. The bluebonnets and wildflowers were in bloom in this magical location, and each time I come away more amazed at the hidden treasures of this park. 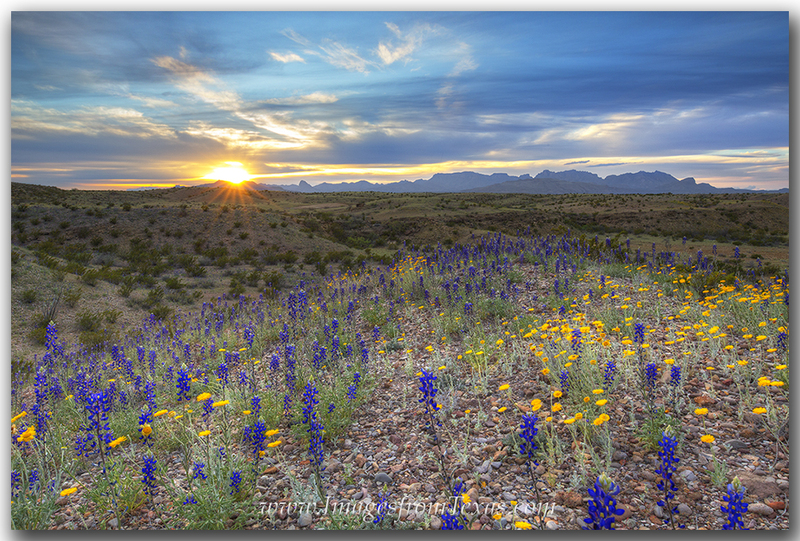 Sunset over bluebonnets and the Chisos Mountains at Big Bend National Park. As I look ahead, our wildflowers here in Central Texas are nearly here. Colorful fields are appearing south of San Antonio, and with the arrival of spring and warmer weather, those colors should be spreading north. Stay tuned for more updates. Another great site to check wildflower updates is www.WildflowerHaven.com. In the meantime, safe travels to everyone – and enjoy the warm weather!